When you’re an adult with bills to pay, children to pick up from school, and a full-time job, the idea of getting a massage seems like a real luxury. After all, you need to prioritize all of your responsibilities before you can think to spend money on an extraneous spa treatment. While we understand this mentality, we want to reframe the way people think of massages. Far from being a luxury treatment, massages are an integral aspect of self-care. It’s the same concept as eating brussels sprouts and broccoli. We don’t scold ourselves for eating healthy vegetables — we celebrate it! You should be thinking the same way about getting massage. It’s far more about treating yourself to good health than anything lavish. At Revelation Chiropractic in Fort Collins, we offer massage therapy services because we believe that massages are a compliment to excellent health and chiropractic care. Here are the excuses we hear most frequently as to why people don’t get massages. 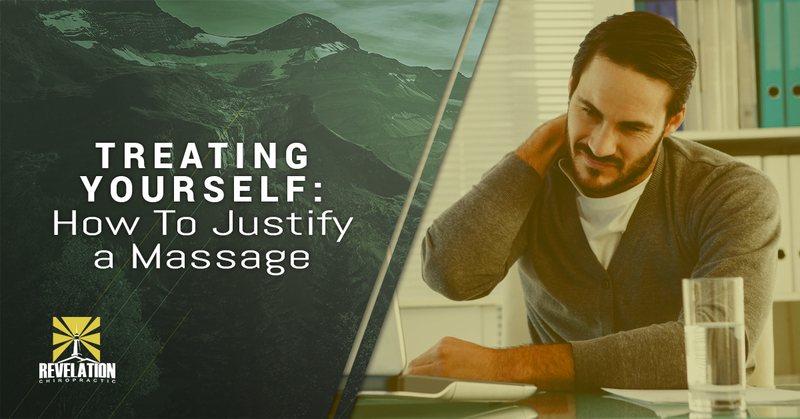 We’ve provided a rebuttal so that you don’t feel guilty scheduling your next massage appointment! A huge misconception people have is that massages are reserved for those who really “need” them — people with injuries, those who work in physically taxing jobs, or professional athletes. Even if you are indeed healthy, daily activities affect our body’s skeletal and muscular systems. When you stand, start to pay attention to which leg supports more weight. This unequal distribution of weight, which we all do, can lead to tight hips, stiff lower backs, and even neck problems. If you get a massage even once a month, you help to maintain your body’s homeostasis by working out the kinks of everyday life. Even if they don’t seem like a big deal now, repeated tightness and imbalance makes you more susceptible to injury down the road. Stress relief is one of the primary benefits of massage therapy, but it’s certainly not the only one! Given its holistic benefits for mental and physical health, massage therapy is much more than a practice in stress relief. You don’t need to join a spa or gym in order to receive massages. In fact, Revelation Chiropractic offers in-home massage therapy appointments in Fort Collins. Whether you have a busy work schedule, do not want to leave kids with a babysitter, have differing mobility levels, or just want the comfort of your own home, schedule an in-home massage is a wonderful option. We even have massage parties available, so you can benefit from a massage while you also socialize with friends, enjoy your favorite beverage, and hangout in a location of your choosing. Massage therapy doesn’t need to mean joining a lavender-infused parlour. Let Revelation Chiropractic come to you in Fort Collins! For a massage therapist in Fort Collins, contact Revelation Chiropractic today!